Ahh, the season of love is upon us. And nothing says love like a bunch of hearts. I got to crocheting these hearts last week. They are so quick and fun to do and are really quite addictive. 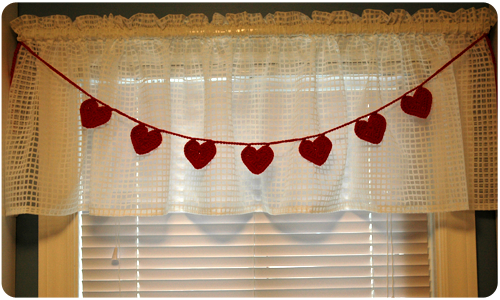 When I had seven hearts done, I strung them together to make a Valentine's Day Heart Garland. The pattern for the hearts and the garland is not my own, but can be found here. I used Lily cotton yarn for this project and a 3.5 mm hook. Deciding where to hang my garland was the next step. 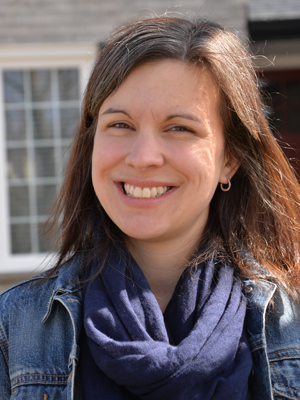 Where in my house needed a little prettying up? The kitchen - lovely as it is. The living room - already overrun with pretty floral pillows, candles and the like. Hmm, I know - the laundry room. 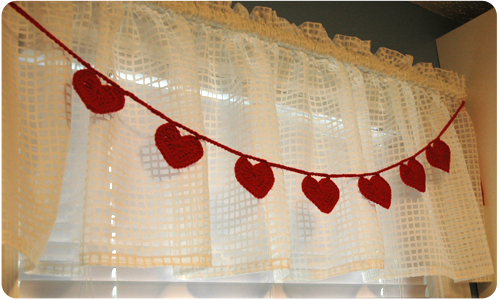 I hung my garland across my laundry room window (I made the valance for this window using this tutorial). Now when I go into the laundry room, this string of lovely hearts catches my eye and makes me smile. I love it. And my girls think it is "so beautiful". I know that a Heart Garland is a Valentine's Day decoration, but would it be so bad if I left it up there once the day has passed? Maybe for the rest of the winter until I make a Spring Garland to replace it with? 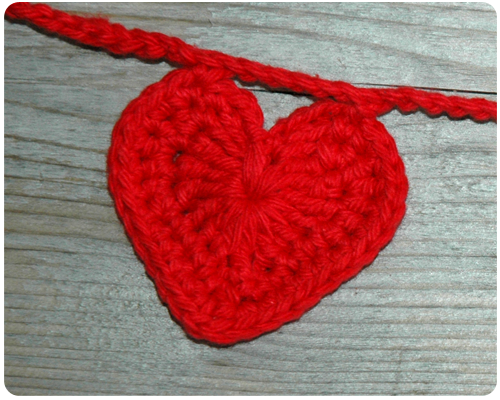 Are you crocheting anything for Valentine's Day?